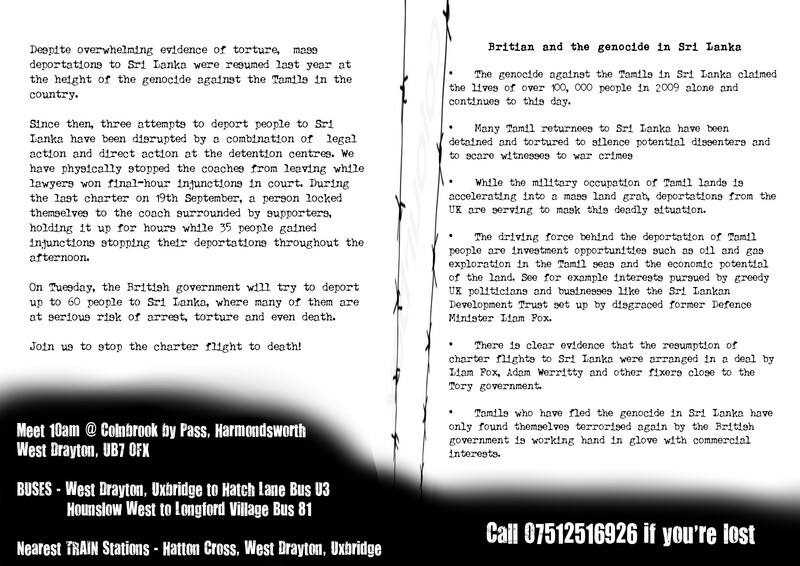 For a short summary of resistance against deportations to Sri Lanka since June 2011, see here. For a more detailed breakdown, including photos and videos, please scroll down. On 6th December 2012, the UK Border Agency went ahead with another mass deportation to Sri Lanka. Unconfirmed reports say that 29 people were removed in total, and that 25 of them were Tamil. 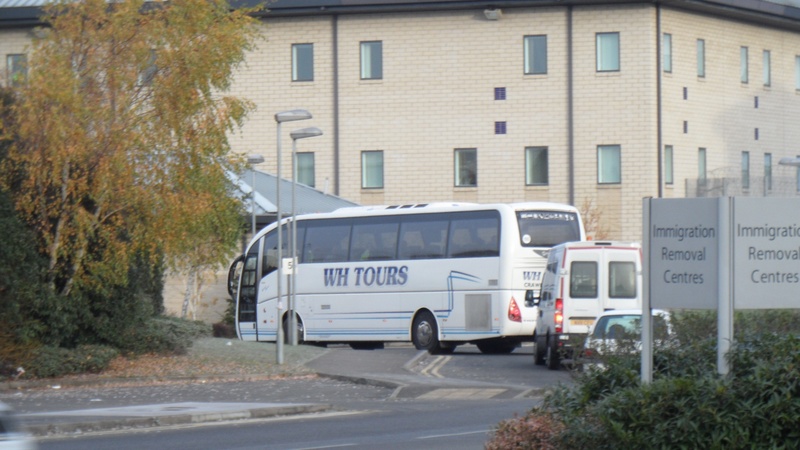 At 0930 on the morning of the flight, campaigners monitored the arrival of 3 coaches to the Colnbrook and Harmondsworth Immigration Removal Centres by Heathrow. Two of the coaches were from the notorious deportation profiteer WH Tours and the third coach was unmarked. Reliance vans also escorted the coaches. All these vehicles are believed to be connected with the deportation to Sri Lanka that afternoon. Media coverage of this deportation was extremely limitted. However, Open Democracy and Journalists for Democracy in Sri Lanka reposted the news article from this blog. Freedom from Torture published a press release highlighting how the UN Committee Against Torture and two Parliamentary Select Committees have recently criticed the British Government’s deportation program to Sri Lanka. 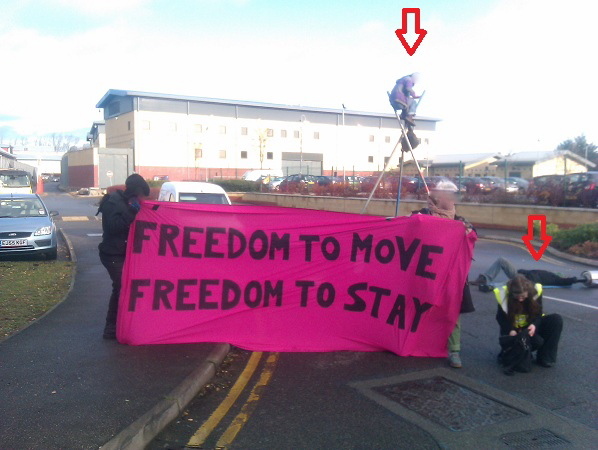 UKBA did not try to get a deportation coach past protestors at Harmondsworth and Colnbrook migration prisons today. News is coming in of many successful injunctions throughout the day (no number confirmed yet) to get individuals off the flight. However some may have flown from other detention centres. Condemning deportations of Eezham Tamil asylum seekers to Sri Lanka by the UKBA, solidarity activists staged a demonstration near Heathrow, London today. The protest called for by an anti-deportation group ‘No Borders which saw the participation of mostly non-Tamil activists, also had participation of activists from Tamil Solidarity. 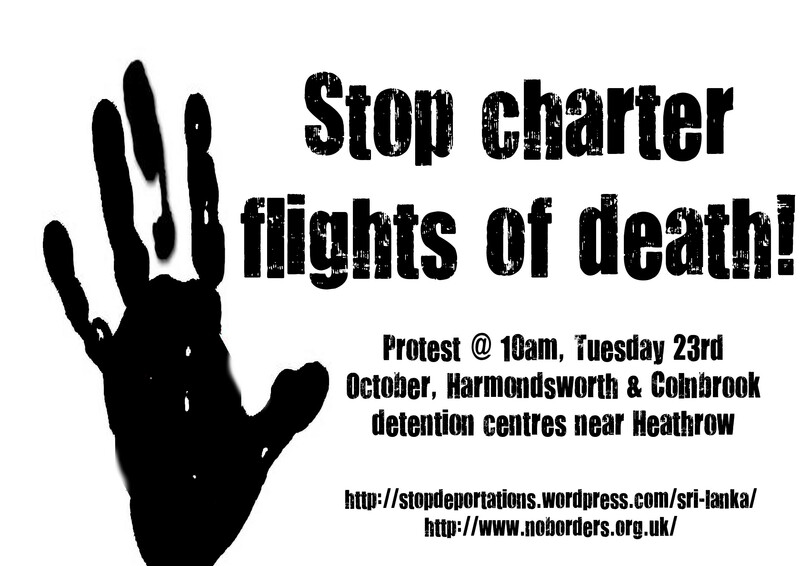 Flyer produced for 23rd October charter, distributed at TUC demo on 20th October. On Tuesday 23rd October, the British government will try to deport up to 60 people to Sri Lanka, where many of them are at serious risk of arrest, torture and even death. Despite overwhelming evidence of torture, mass deportations to Sri Lanka were resumed last year at the height of the genocide against the Tamils in the country. Since then, three attempts to deport people to Sri Lanka have been disrupted by a combination of legal action and direct action at the detention centres. We have physically stopped the coaches from leaving while lawyers won final-hour injunctions in court. During the last charter on 19 September, a person locked themselves to the coach surrounded by supporters, holding it up for hours while 35 people gained injunctions stopping their deportations throughout the afternoon. Together we have the power to stop deportations. If we keep up the pressure we can stop the charters to Sri Lanka. Join us on Tuesday to show solidarity to the deportees and fight the deportation machine. * The genocide against the Tamils in Sri Lanka claimed the lives of over 100, 000 people in 2009 alone and continues to this day. * While the military occupation of Tamil lands is accelerating into a mass land grab, deportations from the UK are serving to mask this deadly situation. * There is clear evidence that the resumption of charter flights to Sri Lanka were arranged in a deal by Liam Fox, Adam Werritty and other fixers close to the Tory government. * The driving force behind the deportation of Tamil people are investment opportunities such as oil and gas exploration in the Tamil seas and the economic potential of the land. See for example interests pursued by greedy UK politicians and businesses like the Sri Lankan Development Trust set up by disgraced former Defence Minister Liam Fox. * Tamils who have fled the genocide in Sri Lanka have only found themselves terrorised again by the British government is working hand in glove with commercial interests. 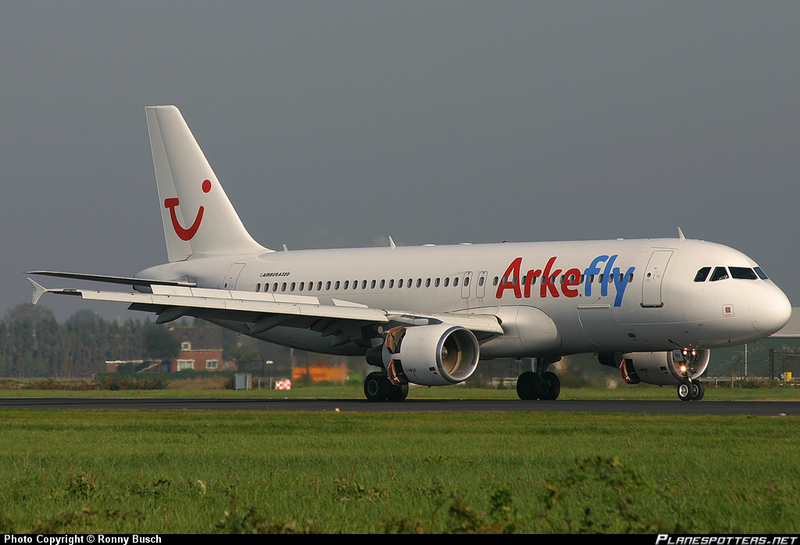 The operator of the flight on 15th December was ArkeFly which is a Dutch charter airline but is owned by the German TUI Group. Given the Sri Lankan government’s reputation for arbitrary detention and torture of deportees, mass deportation raises specific fears for many of the people booked on the flight. Freedom from Torture has published a new report documenting evidence of torture ongoing in Sri Lanka after the end of the civil war. Freedom from Torture also recording a panel discussion outlining why deportations to Sri Lanka are unsafe. Free Movement blog has repeatedly slammed the UK Border Agency’s Country of Origin Information for Sri Lanka. 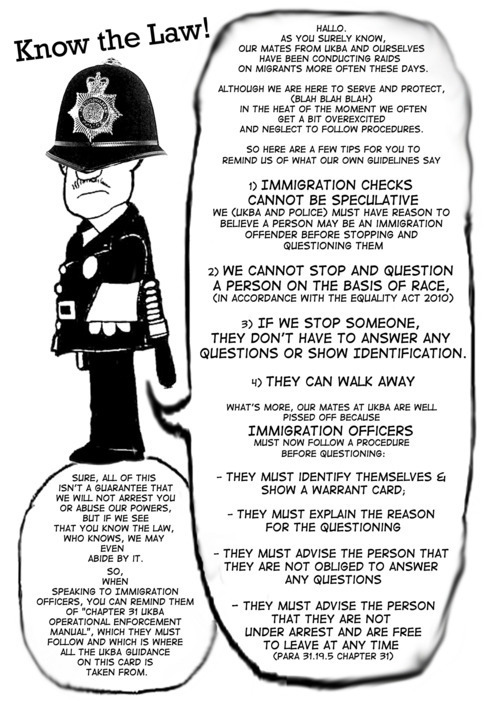 The UK Border Agency last carried out a mass deportation to Sri Lanka on 28th September 2011. 42 men and 8 women were deported from Luton Airport, with 9 others winning last minute reprieves. The first mass deportation from UK to Sri Lanka this year was on 16th June 2011. Channel 4 News closely followed the story.